This was a special commission for many reasons. The venue was beautiful Camp Wayfarer in Flat Rock NC (outside of Asheville). I was commissioned by Ashley’s parents to paint the first dance in watercolor. I thank Amy Wood and Shay Brown of Shay Brown Events for introducing my service to the Strickland family. This was also my birthday weekend and I got to spend it doing what I love- painting! This was going to be an outdoor wedding. 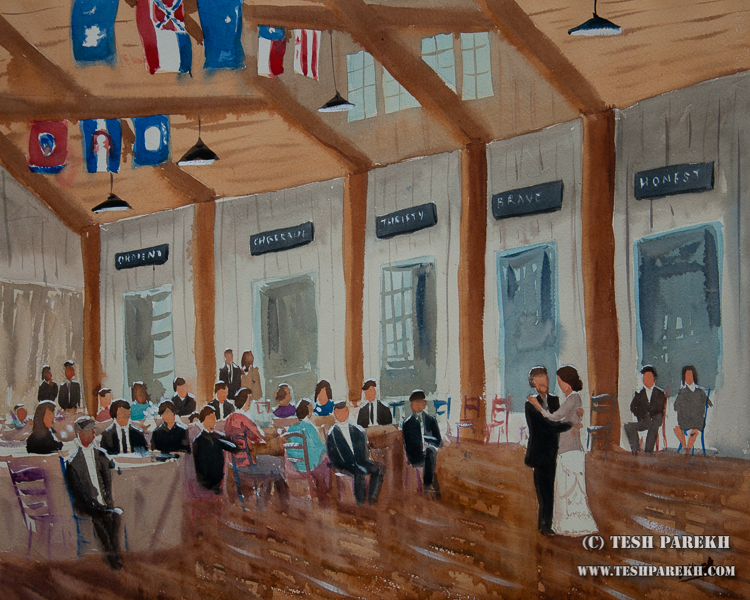 But, the weather turned south so, ceremony and reception took place inside dining hall of the Camp. I arrived couple of hours ahead of the reception to set up. The venue was setup for the ceremony. I love those flags and chairs! Camp Wayfarer dining hall was setup for the ceremony when I arrived. After the ceremony was over, the hall was transformed into reception venue. I found a spot that will give me the best composition and set up my easel. 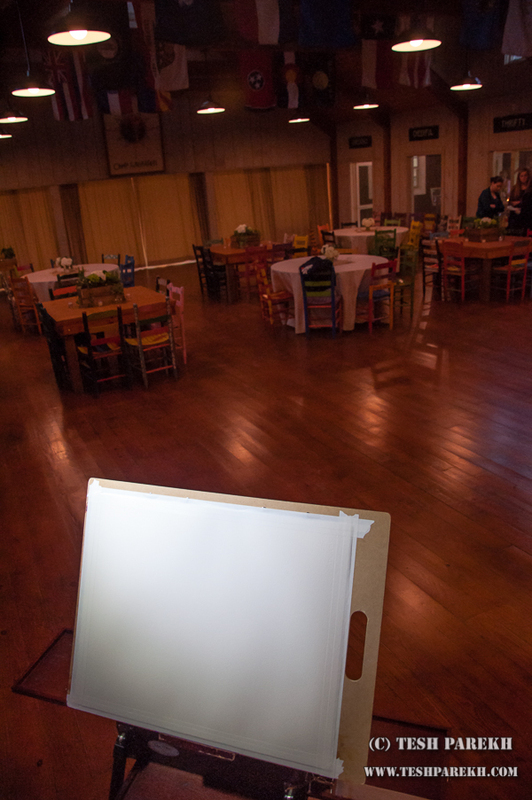 Setup and ready to paint Ashley and Ben’s first dance. There was a change in the schedule- the first dance took place later in the reception. So, I kept on painting. I keep my painting setup and process flexible. It was cold! And it was raining hard outside, raising the humidity. Being a plein air artist, I enjoy the challenge of painting on location. Every element makes location paintings special. 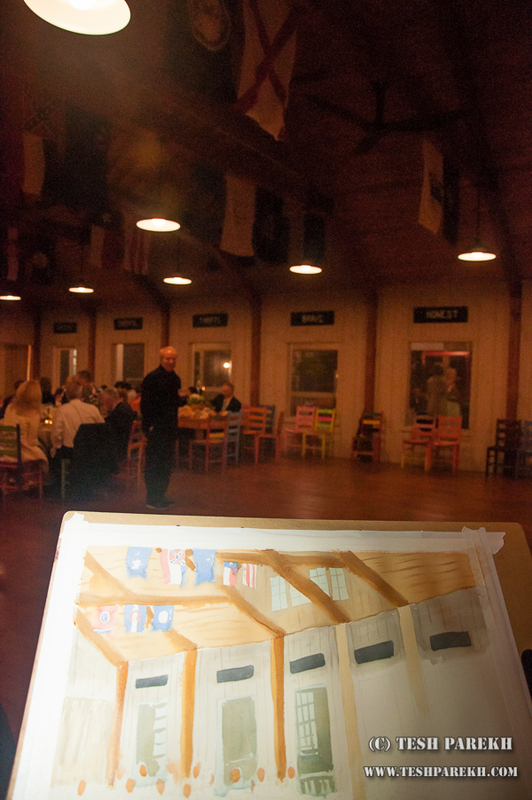 Live painting of wedding reception in progress. I sketched Ashley and Ben’s first dance in pencil. I make sketches and then use those as reference for my paintings. I also sketched wedding guests enjoying the first dance. 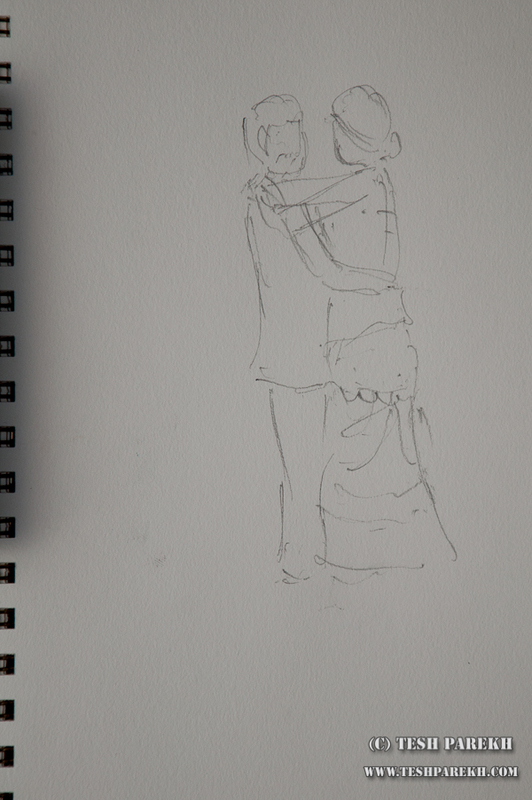 Below is the first dance sketch which I made in few seconds. Pencil sketch of Ashley & Ben’s first dance. I had approximately an hour to finish my painting. By now, the dance floor was open. Everyone was having a great time dancing to the live band. I kept on painting next to the dance floor. Many guests stopped by to look at the painting-in-progress. Once the painting was finished, Amy Wood of Shay Brown Events helped me present it to the Strickland family. Bride loved her painting! And that is my ultimate reward. I matted the painting and it was displayed on an easel.